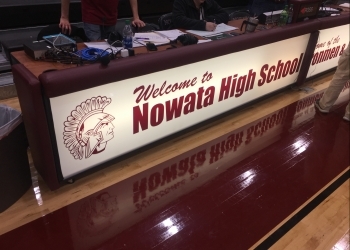 Nowata led wire-to-wire in a convincing victory over Caney Valley, 61-47. The Ironmen got off to a hot start and never looked back on the way to their fifteenth win of the season. Mark Price knocked down three-pointers on the first two possessions of the game. Before you could blink Nowata’s lead was stretched to 11-2, midway through the first quarter. It was 21-8 by the end of the first period. The teams were nearly even from that point on but the big advantage for the Ironmen never dwindled. Caney Valley was never able to get the lead to single digits. Nowata continued to find holes in the Trojans zone defense all night long. This three-pointer from Price kept the Ironmen momentum going late in the first half. Price led the charge with 20 points on six three-pointers. The Ironmen had four different players in double-digits on the night. The Trojans were led by freshman Daniel Barham who tallied 13 points. Caney Valley falls to 10-9 on the season. Nowata will host Caney, Kansas on Friday for senior night.